The owner of a hotel in Cookstown has been released on police bail after three teenagers died at his premises on St Patrick's Day. Michael McElhatton (52) was arrested on suspicion of manslaughter on Tuesday following the deaths of the teenagers at the Greenvale Hotel. Police confirmed he had been released on bail to return for further questioning at a later date. On Wednesday police said they had seized suspected Class A drugs following a search at a house in Moneymore on Tuesday. But Mr McElhatton was de-arrested following fast-track forensic examination of the white powder substance and tin foil found during the search. In a statement Mr McElhatton said that he had "nothing whatsoever" to do with drugs. "While I wished to respect the ongoing investigation by the police into the tragic deaths of the three young people at the Greenvale Hotel on St Patrick's night, I have no choice but to make it completely clear that I have nothing whatsoever to do with drugs," the statement read. "I can assure everyone that whatever any suspicions the police have raised about me in relation to anything to do with drugs is totally without any basis." Mr McElhatton said the powdery substance was taken by police from the laundry. "I am shocked and horrified that the powdery substance taken by police from the laundry in my house could be drugs," he said. Following the "de-arrest" police released a clarification confirming that there was "no suspicion of any crime relating to misuse of drugs on behalf of the person who still remains in custody". Assistant Chief Constable Mark Hamilton said that the action taken by police was in "good faith and in line with procedure". "We will continue to carry out a rigorous investigation into the circumstances surrounding the deaths of these three young people and we are deeply grateful for the huge assistance we are receiving from the community and we hope that people will continue to come forward and assist us with this enquiry,” he said. A spokesperson for Mr McElhatton had confirmed on Tuesday evening that he had been arrested in connection with the manslaughter charge. A 40-year-old man was also arrested on suspicion of manslaughter on Tuesday. He remains in police custody. 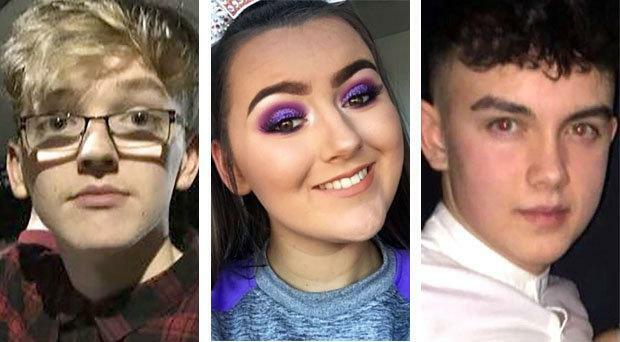 Lauren Bullock (17) from Donaghmore, and Morgan Barnard (17) and Connor Currie (16), both from Dungannon, died following a crush at the hotel door as crowds of young people waited to gain entry. Their funerals will take place on Friday. Around 400 people were trying to get into the venue after being dropped off by buses on Sunday night. Police said a crush at the door resulted in some people falling. Officers said people struggled to get off the ground and there was confusion in the immediate aftermath between 9pm and 10pm. A major police investigation into the deaths was launched on Monday.